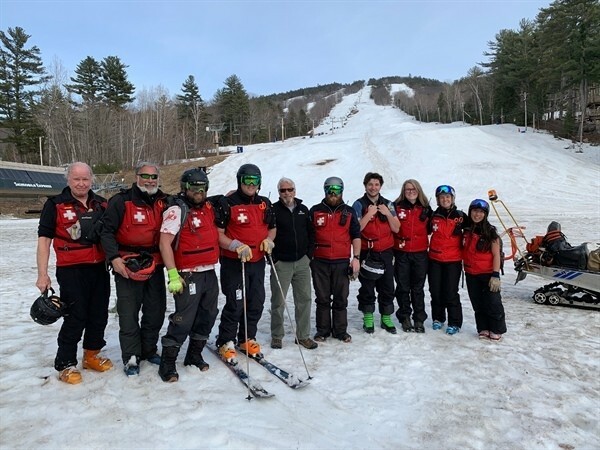 It's a Wrap - Cranmore Mountain Resort's Ski Patrollers pose after their last sweep of the season on April 8, 2019. (Cranmore). A series of winter storms totaling 107 inches of snowfall, and consistent cold temperatures allowing near nonstop snowmaking, helped New Hampshire’s Cranmore register the longest ski season in its 81-year history. Since 2010, the resort has invested nearly $2 million in snowmaking improvements, which includes the addition of over 500 energy-efficient snow guns, increasing Cranmore's inventory of energy-efficient guns by 400%. Upgraded pipe has increased water capacity and flow on the mountain. These improvements have allowed the resort to not only be more efficient with snowmaking operations, but to have more terrain open, earlier in the season. "We strive to improve snowmaking at Cranmore each year," says Ben Wilcox, Cranmore President and General Manager. "These investments continue to let us lead the region in snowmaking and grooming quality." Adds Cranmore’s Becca Deschenes, "This was the season it all came together for us. Our snowmakers, our groomers and other operations personnel were working in unison to meet both early season demand and those last few days when visitors weren't quite ready to hang up their skis and boards." Work is underway to ready Cranmore's Aerial Adventure Park, and other rides and attractions such as a mountain coaster, zipline, kids rope course, bungy trampoline, summer tubing, giant swing, and Knockerball, for a planned summer opening Memorial Day 2019.